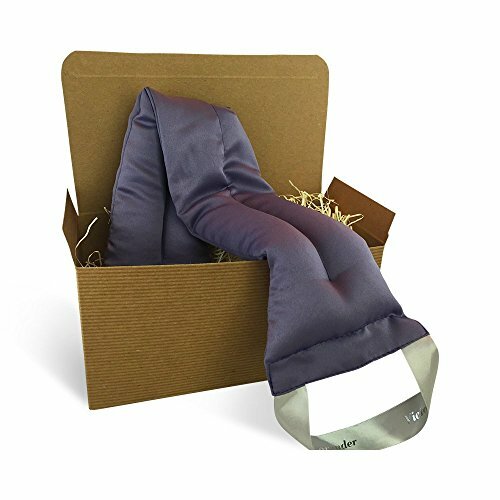 Our exclusively designed Neck Wrap is made to place on your neck and shoulders to help relax tensions and soothe headaches. Filled with flax seed and a generous amount of French Lavender. Our neck wrap is truly the softest, most relaxing neck wrap we’ve ever made and provides the ultimate in pain and stress relief. The soothing warmth will melt away the pain, tension, and stiffness from your neck, back and shoulder areas leaving you feeling relaxed, renewed and refreshed. Colors may vary. LUXURIOUS: Meticulously crafted from the finest silky soft material. AROMATHERAPEUTIC: Is filled with all-natural lavender & flax seed to offer softness and a truly remarkable scent. THERAPEUTIC: Use for migraine relief, tension headaches, neck pain, stress relief.